Brahms was the subject of my doctoral studies. The title of my Thesis was Romantic poetry as inspiration of Brahms. Description and analysis of the early poem collection of the composer. The translation work was supported by a generous scholarship of the Emil Aaltonen foundation. The thesis is about an early poem collection ("Gedichtsammlung") made by Brahms in 1853. It contains poems of 13 German poets of the romantic period. The poem selection is an unpublished document and there is very little research about it. Young Brahms had written his favourite poems down in the archaic German of the early 19th century and with German blackletter handwriting called Kurrent Script (later Sütterlin Script). Many of the symbols of this old handwriting differ so much from the script used in these days that for most people outside of Germany, as well as younger Germans, the Kurrent script is nowadays nearly illegible. I also started my research work by learning to read and write this script. Romantic poetry as inspiration of Brahms. Description and analysis of an early poem collection of the composer. Johannes Brahms; Literary predilection of young Brahms; Romanticism; Poetry; Poem analysis; Literature studies; Music analysis; Research of historic sources; Lieder; Jean Paul; Achim von Arnim; Clemens Brentano; Adelbert von Chamisso; Ludwig Uhland; August von Platen; August Heinrich Hoffmann von Fallersleben; Gustav Pfarrius; Julius Mosen; Robert Reinick; Constantin Wurzbach von Tannenberg; C. O. Sternau; Christian Hoeppl. Brahms’s fragment of a poem collection (Fragment einer Gedichtsammlung), at the present day in the possession of the Stadt und Landesbibliothek of Vienna, is a handwritten notebook which belonged to the composer. Brahms wrote down the poems probably partly because of his general interest in the literature, but the main aim of the collection may have been to serve his work as a Lied composer. The poems in the collection were selected at the earliest in 1853. Brahms used the texts of the poem collection in seven compositions. Six of them are Lieder and the seventh is the F minor piano sonata Op. 5, which included a poetic motto from C. O. Sternau’s poem “Der Abend dämmert, das Mondlicht scheint”. Brahms’s songs Liebe und Frühling I Op. 3 No. 2 and Liebe und Frühling II Op. 3 No. 3 and probably also the song fragment Die Müllerin Anhang III Nr. 13 were composed in the summer of 1853. Brahms also set this poem to music later (1859–1860) when he wrote a female chorus song Die Müllerin Op. 44 No. 6. Another choral work from this period is Die Nonne Op. 44 No. 5. The last known composition based on the texts in the poem collection is the vocal quartet An die Heimat Op. 64 No. 1 after C. O. Sternau (1864). Some stylistic features, themes, symbols and other details are repeated in many of poems in the collection. By studying these similarities it is possible to ascertain what the 20-year-old Brahms found important when he selected potential lyrics for his songs. One has to keep in mind, however, that this stylistic resemblance is also partly caused by the fact that almost all of the poems in Brahms’s collection were by the Romanticists from the beginning of the 19th century. Brahms preferred to use strophic Lieder in his compositions and this is also obvious in the poem collection. Most of the poems in Brahms’s collection are in rising metre; 75% of them are either Iamb or Iamb-Anapaest. Iambic metre is typical for Germanic languages and it is very common in German poetry. Falling metre, in other words Trochee or Dactyl, is quite rare in Brahms’s notebook. It is obvious that one theme is more important than the others: The comparison and union of love and nature. Nature is an important thematic element in at least 26 love poems in Brahms’s poem collection – more than half of all the poems. Most of the poems in Brahms’s collection are Romantic love poetry. Other themes also emerge from Brahms’s poem collection. The romanticized working people, such as miller’s daughters, spinners and hunters, were an agreeable topic for authors in the 19th century. Romantic folk poetry is also present in Brahms’s collection, since he has chosen four poems from Des Knaben Wunderhorn, the most famous collection of German folk poems of his time. Four poems chosen by Brahms are about convent life. The Romanticists drew their inspiration from the history of the Middle Ages and the Catholic Church, and the cloisters were therefore a typical scene in the literature of the time Countless cloister poems and novels were written in the Romantic Era, and many of them included tragic features. Although allusions to the religious topics can be found in eight poems in the collection, the religious feelings expressed in the poem collection are very moderate. The enthusiastic Catholic piety of Ludwig Uhland’s “Die Nonne” is exceptional in the entirety of the poem collection. In general, the themes of Brahms’s poem collection can be described as typically Romantic. 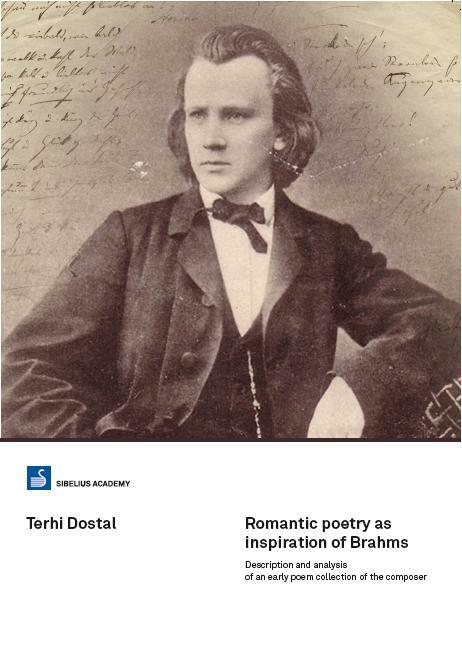 Although Brahms’s personal likings and purposes certainly affected his choices, the ideals and themes of Romantic literature are to be seen on every page of the poem collection.